and satisfies the needs of stakeholders. Now, the question is what is the difference between verification and validation ? Verification is the process to make sure the product satisfies the conditions imposed at the start of the development phase. In other words, to make sure the product behaves the way we want it to. Validation is the process to make sure the product satisfies the specified requirements at the end of the development phase. In other words, to make sure the product is built as per customer requirements. A primary purpose of testing is to detect software failures so that defects may be discovered and corrected. Testing cannot establish that a product functions properly under all conditions but can only establish that it does not function properly under specific conditions. 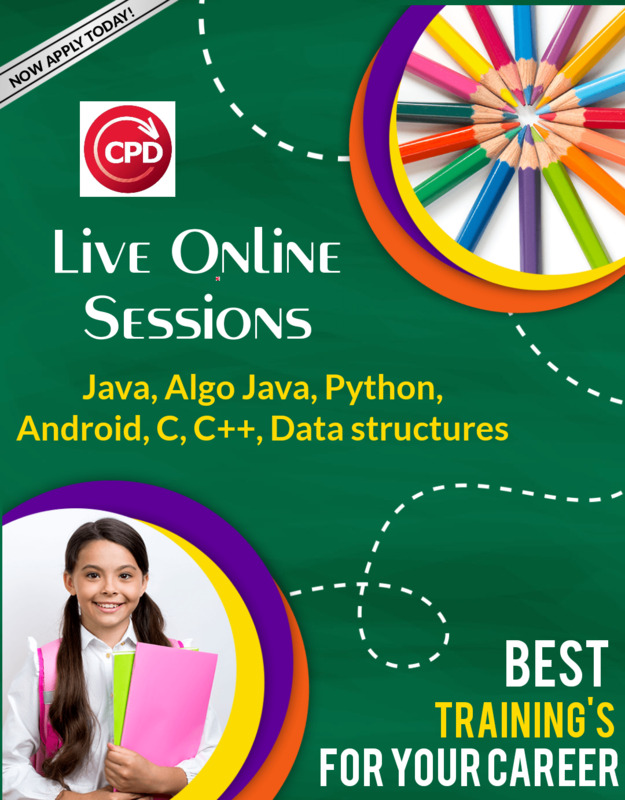 The scope of software testing often includes examination of code as well as execution of that code in various environments and conditions as well as examining the aspects of code: does it do what it is supposed to do and do what it needs to do. Testing can never completely identify all the defects within software. Instead, it furnishes a criticism or comparison that compares the state and behavior of the product against principles or mechanisms by which someone might recognize a problem. 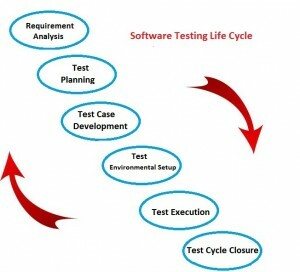 There is a typical life cycle for testing. The sample below is common among organizations employing the Waterfall development model. The same practices are commonly found in other development models. Test Execution: Testers execute the software based on the plans and test documents then report any errors found to the development team. Defect Retesting: Once a defect has been dealt with by the development team, it is retested by the testing team. AKA Resolution testing. Regression Testing: It is common to have a small test program built of a subset of tests, for each integration of new, modified, or fixed software, in order to ensure that the latest delivery has not ruined anything, and that the software product as a whole is still working correctly. Static Testing: Reviews, walkthroughs, or inspections are referred to as static testing. Static testing is often implicit, as proofreading, plus when programming tools/text editors check source code structure or compilers (pre-compilers) check syntax and data flow as static program analysis. Static testing involves verification. Dynamic Testing: actually executing programmed code with a given set of test cases is referred to as dynamic testing. Dynamic testing takes place when the program itself is run. Dynamic testing may begin before the program is 100% complete in order to test particular sections of code and are applied to discrete functions or modules.Dynamic testing involves validation. Together they help improve software quality. 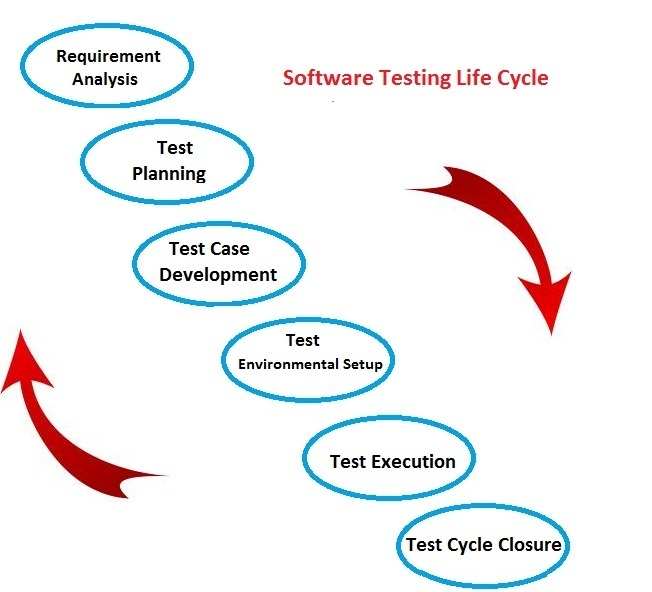 Software testing methods are traditionally divided into parts- White-Box Testing and Black-Box Testing. White-box testing (also known as glass box testing or structural testing) tests internal structures or workings of a program. In white-box testing an internal perspective of the system, as well as programming skills, are used to design test cases. The tester chooses inputs to exercise paths through the code and determine the appropriate outputs. While white-box testing can be applied at the unit, integration and system levels of the software testing process, it is usually done at the unit level. It can test paths within a unit, paths between units during integration, and path between subsystems during a system–level test. Though this method of test design can uncover many errors or problems, it might not detect unimplemented parts of the specification or missing requirements. 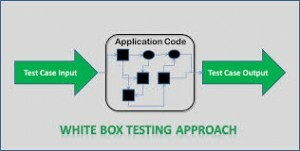 White box testing is often used for verification. Fault Injection Methods – intentionally introducing faults to gauge the efficacy of testing strategies. 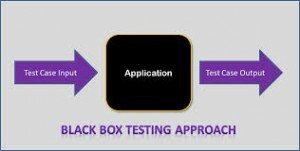 Black box testing (also known as functional testing) is a testing technique that ignores the internal mechanism of the system and focuses on the output generated against any input and execution of the system. The testers are only aware of what the software is supposed to do, not how it does it. 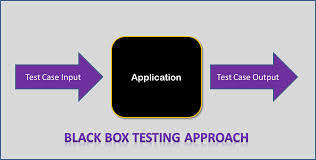 Black-box testing methods include: equivalence partitioning, boundary value analysis, all-pairs testing, state transition tables, decision table testing, fuzz testing, model-based testing, use case testing, exploratory testing and specification-based testing. 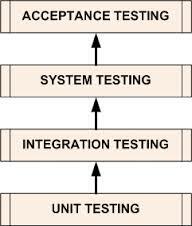 This method of test can be applied to all levels of software testing: unit, integration, system and acceptance. Black box testing is often used for validation. One advantage of the black box technique is that no programming knowledge is required. Whatever biases the programmers may have had, the tester likely has a different set and may emphasize different areas of functionality. It has a disadvantage also. Because they do not examine the source code, there are situations when a tester writes many test cases to check something that could have been tested by only one test case, or leaves some parts of the program untested. 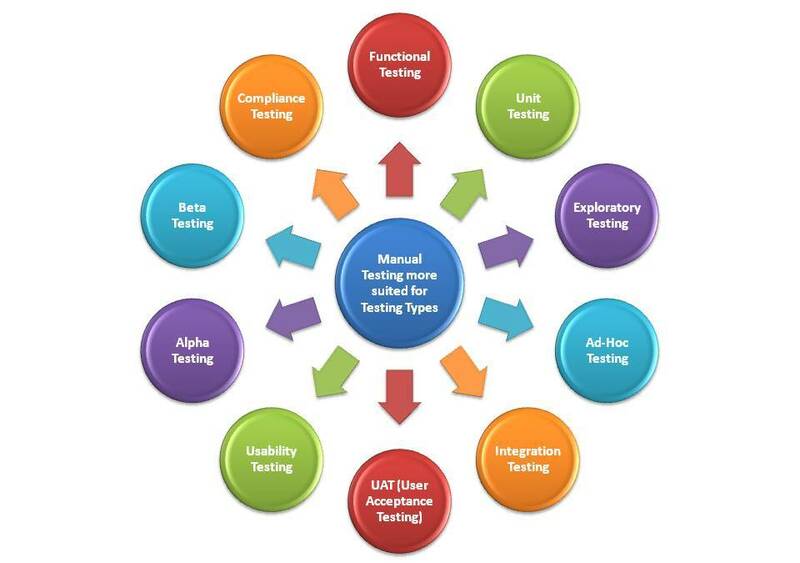 There are generally four recognized levels of tests: unit testing, integration testing, system testing, and acceptance testing. Unit testing is the testing of an individual unit or group of related units. It falls under the class of white box testing. It is often done by the programmer to test that the unit he/she has implemented is producing expected output against given input. One function/unit might have multiple tests, to catch corner cases or other branches in the code. Unit testing alone cannot verify the functionality of a piece of software, but rather is used to ensure that the building blocks of the software work independently from each other. Integration testing is testing in which a group of components are combined to produce output. Also, the interaction between software and hardware is tested in integration testing if software and hardware components have any relation. It may fall under both white box testing and black box testing. Integration testing works to expose defects in the interfaces and interaction between integrated components (modules). System testing is the testing to ensure that by putting the software in different environments (e.g., Operating Systems) it still works. System testing is done with full system implementation and environment. It falls under the class of black box testing. System testing, or end-to-end testing, tests a completely integrated system to verify that it meets its requirements. At last the system is delivered to the user for Acceptance testing. Acceptance testing is often done by the customer to ensure that the delivered product meets the requirements and works as the customer expected. It falls under the class of black box testing. A common cause of software failure (real or perceived) is a lack of its compatibility with other application software, operating systems (or operating system versions, old or new). Alpha testing is simulated or actual operational testing by potential users/customers or an independent test team at the developers' site. Alpha testing is often employed for off-the-shelf software as a form of internal acceptance testing, before the software goes to beta testing. Beta testing comes after alpha testing and can be considered a form of external user acceptance testing. Versions of the software, known as beta versions, are released to a limited audience outside of the programming team. The software is released to groups of people so that further testing can ensure the product has few faults or bugs. Sometimes, beta versions are made available to the open public to increase the feedback field to a maximal number of future users. Varun Jain liked this on Facebook. Garima Saini liked this on Facebook. Deepak Kumar liked this on Facebook. Sandhya Singh liked this on Facebook.